150,000 spectators. This multi-purpose stadium was completed on May 1, 1989. It is currently used for soccer matches, a few athletics matches, but most often for Arirang Festival performances, which is gymnastics and artistic festival. 120,000 spectators. A multi-purpose stadium used for soccer and athletics. It was opened in January 1984. 109,901 spectators. 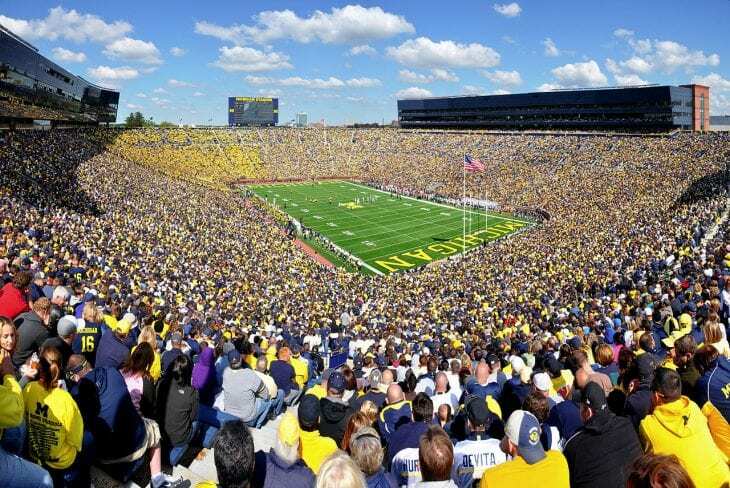 Nicknamed “The Big House”, this football stadium for the University of Michigan was built in 1927 and was expended several times since then (last time in 2010). It is the home of the Michigan Wolverines football team. 106,572 spectators. This football stadium is located on the campus of The Pennsylvania State University and the home stadium of Penn State Nittany Lions football team. It first opened on September 17, 1960 and last expended in 2001. 105,000 spectators. Opened in 1966 and renovated in 1985, this soccer stadium is the official home stadium of the Mexico national team and the Mexican club Club América. 102,455 spectators. This football stadium is the home of the Tennessee Volunteers football team, but is also used to host large conventions and has been a site for several NFL exhibition games. First opened in 1921, it was expanded and renovated many times over the years, with the most recent renovation in 2010. 102,329 spectators. Located on the campus of The Ohio State University. Its primary purpose is the home venue of the Ohio State Buckeyes football team. First opened in 1922 and most recently renovated in 2001. 101,821 spectators. This stadium is the home stadium for the University of Alabama football team. The stadium opened in 1929 and was originally named Denny Stadium in honor of former University of Alabama president George H. Denny. The stadium’s name was amended to Bryant–Denny Stadium in 1975 after the Alabama legislature chose to honor famed Alabama coach Paul “Bear” Bryant. The stadium underwent many expansion over the years, most recently in 2010. 100,119 spectators. This stadium has been home to the University of Texas at Austin Longhorns football team since 1924. 100,018 spectators. Opened in 1854, this multi-purpose stadium is used for cricket, Australian rules football and soccer. It is the home stadium to the Melbourne Cricket Club. It’s the largest stadium in Australia and the biggest cricket stadium in the world. The MCG is remembered worldwide as the main stadium of the 1956 Summer Olympics. 98,797 spectators. Soccer stadium, home to Football Club Barcelona. Opened in 1957, expanded in 1982, and most recently renovated in 2008. One of the most famous stadiums in the world.